This is the fourth article of the five-part series on Data Analysis in Excel. 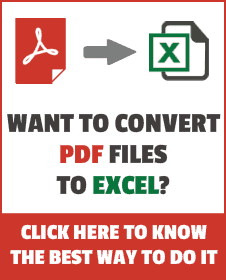 In this section, I will show you how to use Goal Seek in Excel. One Variable Data Table in Excel. Two Variable Data Table in Excel. 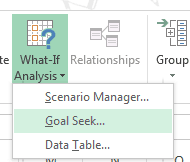 Goal Seek in Excel, as the name suggests, helps you in achieving a value (the goal) by altering a dependent value. For example, I have the data (as shown below), where I calculate the Monthly payment outflow with the given Loan Amount, Interest Rate and Number of Payments. [Monthly payment is in red and in round brackets as it is an outflow]. Now, I want to calculate the loan amount so that my monthly payment is $1,000. 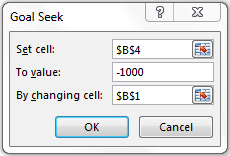 I can try and use some trial and error by putting random values in Loan amount, but there is a better way to do this – using Goal Seek in Excel. Go to Data –> Data Tools –> What-If Analysis –> Goal Seek. Set Cell: B4 (this is the cell with the goal/target). To Value: -1,000 (this is the goal value. Its negative here as it is an outflow). By Changing Cell: B1 (this is the loan amount that we want to change to achieve the goal value). Click OK. This will open the Goal Seek Status dialogue box. Goal Seek Status dialogue box will inform you when a solution is found. 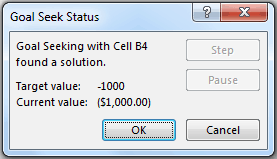 If you wish to accept the solution, click on the OK button, and it will change the cell values. If you do not want to accept the solution, click on Cancel. It may happen that the Goal Seek is not able to find a solution. It will show you the relevant prompt in that case. Once you accept the solution, it will be reflected in the cells. Calculating Weighted Average in Excel. Amazing! Exactly what I was looking for.